You are currently browsing the tag archive for the ‘Vegan With A Vengeance’ tag. Hey everyone! On Sunday Morning I made the best waffles I have made in my entire life. I made the awesome Pumpkin Waffles from VwAv. 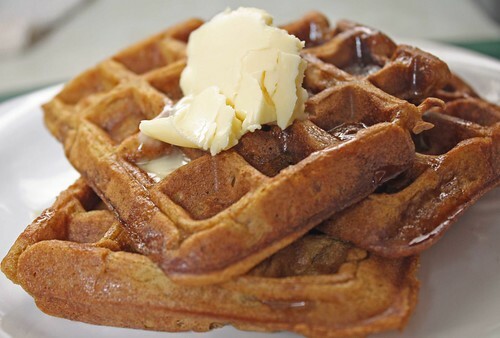 These waffles are so good, perfect for the fall time! I made them so I can serve to my family at the same time but my waffle iron only makes 2 waffles and they took forever, so my dad and brothers couldn’t wait so they made some else. I was a bit disappointed at my waffle iron, but I think I want to buy another one that makes 4 at a time and then I can make 6 waffles at a time! That would be awesome! The recipe makes a lot of waffles so I ended up freezing them so I can have them as breakfast before school. Today for dinner, I made the most awesome Tofu I have ever made besides the Chile Cornmeal Tofu which was also awesome. I made Pistachio Crusted Tofu which I was dying to make for so so long. I am glad I finally got to it and created a recipe for it. I was so happy at the result, my brother (a.k.a. my toughest food critic) liked them, he said they were really good. The only thing I would change is add just a bit more pistachios to the breading mixture. By the way pistachios are extremely addictive, I love them so much. I also had some Garlicky Kale and Lemon Provicenal Rice from the Mediterranean Vegan Kitchen Cookbook. I served the tofu with a Mustard Cashew Cream Sauce which complicated the tofu so well. I finally figured out an awesome to replace heavy cream in sauces, its really simple, just combine some cashews and soy milk together and then just put it in whatever recipe you are making. The cashews add a great richness to the soy milk. 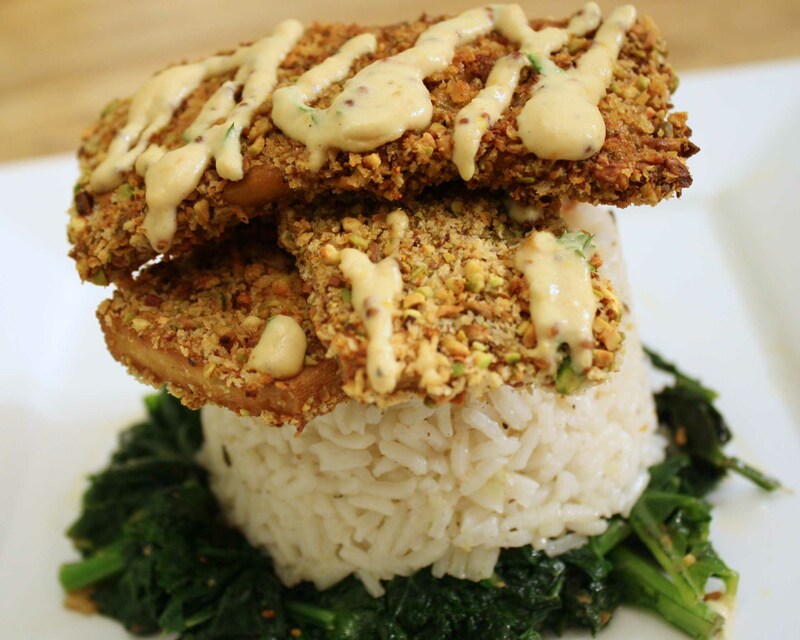 Here’s the recipe for the Pistachio Crusted Tofu and Mustard Cashew Cream Sauce. Mix the ingredients for the marinade into a bowl. Then brush on to the tofu and marinade it for about 15-30 minutes. Grind the pistachios in a food processor until crumbs form. Mix the breading ingredients together. In a small bowl add the Dijon mustard. Brush the tofu with the Dijon mustard and then bread it in the breading mixture. Bake it for about 15 minutes until golden, if you want put it under the broiler for 3-5 minutes for extra chewiness. In a food processor, blend the cashews and soy milk until very smooth. Heat a sauce pan to medium heat, and add the garlic and shallot. Saute for 2 minutes. Then add the cashew cream and the two types of mustard and blend together. Bring it to a boil and then simmer for about 4 minutes. This thickens up fairly quick. Season with Salt and Pepper. Add the lemon and parsley and that’s it. Now you can use this to top any protein dish like tofu, seitan, tempeh, and even the great chickpea cutlets!!! Hey everyone! This week I bought some tempeh from the natural food supermarket. Everything was so expensive there! I had to beg my mom to go to that supermarket but at the end I wasn’t that happy, as everything was so overpriced. We bought only 4 things, brown rice syrup, agar, tempeh, and a bag of chips. I just don’t know why the natural supermarkets have to be so overpriced. The produce at the supermarket was amazing!!! With the high prices, I rather shop at the regular supermarket or Trader Joe’s. Today I used the tempeh and made the vwav tempeh sausage crumbles. I then had some jarred tomato sauce and mixed that in. 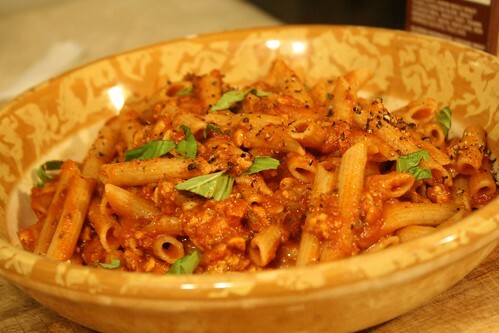 It is very very rare for me to use store-bought jarred tomato sauce. I love making my own sauce, in fact I make almost everything from scratch. The pasta and tempeh crumbles were really good! I love tempeh so much! I even ate some raw and it taste awesome, that’s how much I love it! Here’s a picture below, not the best picture, sorry I was a bit lazy today! Hey everybody! Today was my 16th birthday! For my birthday I made one of my favorites Spanakopita! 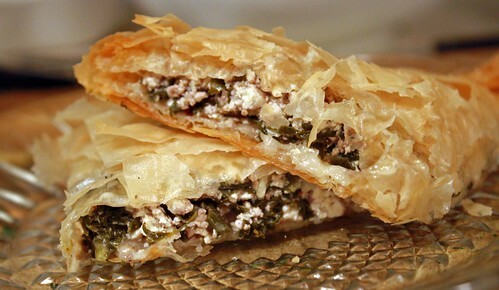 I love this spanakopita from vwav, it is so so good! I think the reason why I love it so much is because vegetable pies are very big in Albanian food and that it is just so awesome. I make the Spanakopita alot. Sometimes I make the dough with the help of my grandma or take the shortcut and use phyloo dough. Either way it is equally delicous. Last night I made a Chickpea-Vegetable Bouillabaise from the Mediterranean Vegan Kitchen Cookbook. 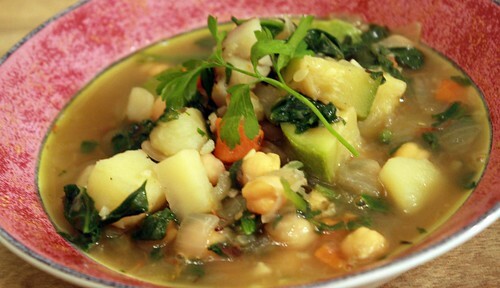 A bouillabaise is tradtionally made with fish but this vegan version is so good! Bouillabaise means boiling without stopping as this is exactly what this soup did. I really suggest everyone to get the Mediterranean Vegan Kitchen Cookbook. I negelected it for a while but now I am loving it and find new recipes to make each time I look at it. Its kinda werid that I didn’t make any sweets for my birthday, its just that I was so busy and kinda ran out of time. Of well everyday is your birthday when your healthy as my mom always says. That’s it for tonight everyone! Day 3 of Vegan MoFo. I really am enjoying VeganMoFo, it has gotten me to write on my blog everyday so far! It’s been a while since I have eaten pizza, about 3 months. You see I’m not crazy for pizza but when I get that craving for it once in a while I have to make it. Today I made a delicious pizza! 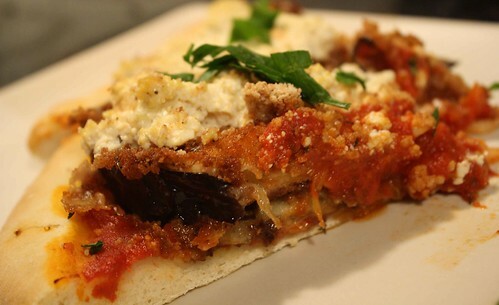 I made an Eggplant Parmesan Pizza. It was so good! 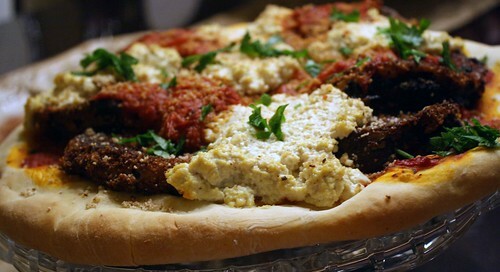 I really love the combination of eggplant and pizza! The pizza was fairly simple to make. I used Isa’s recipe for the dough and sauce. I then breaded some eggplant and fried it. Also I made some tofu ricotta from vwav to top it all off. So this is how it all goes. 3. Bread the eggplant and fry it. 4. Make the tofu ricotta. 6. Ladle some sauce, then arrange the eggplant nicely, top it off with some more sauce and finally the tofu ricotta and also some almesan from v’con.